Sen. Elizabeth Warren has done a whole lot of battling with herself. For a candidate who's not even technically a candidate yet, Sen. Elizabeth Warren has done a whole lot of battling with herself. This time two words, in Warren's own handwriting, are forcing her to explain herself. The Washington Post reported on Tuesday that, in registering for the Texas bar in 1986, Warren wrote in for race: "AMERICAN INDIAN." It prompted another apology from Warren, just days before she's set to formally launch her campaign. The revelation seems to undercut her long-held contention that she never used her claim of Native American heritage in a professional setting that may help her career, though the Warren camp points out that information on the bar registration was for statistical purposes only and wouldn't have helped her professionally. The problem for Warren isn't just that she walked into something of a trap set by President Donald Trump, with her DNA test and decision to litigate her heritage. The president's racist taunts remain far worse than anything supposed offense by Warren regarding her ethnicity. The problem is that in this era where authenticity is at a premium -- where the clamor for Beto O'Rourke grows in his absence, to cite one example -- Warren's most important battle may be over how she defines herself. That's a tough argument to win. In many ways it was an old speech for a new audience. 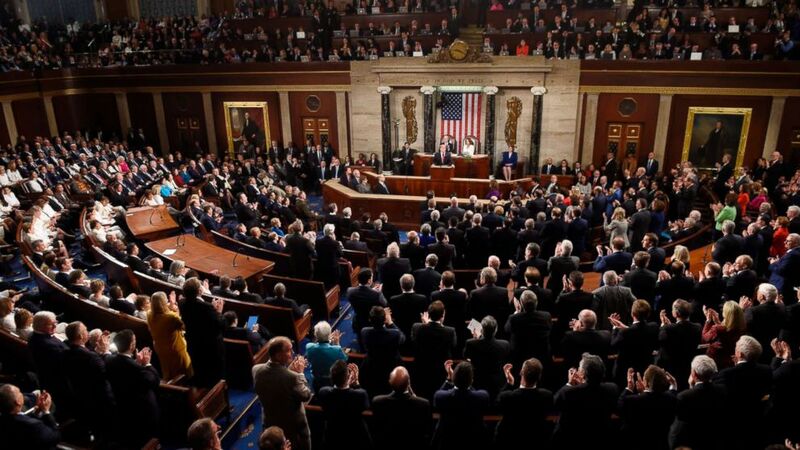 The president stuck to that tough, dark rhetoric of his about immigration and crime at the border, but looking back at him for his second State of the Union address was a sea of Democrats on the House side sitting stoically and sternly registering their disapproval. 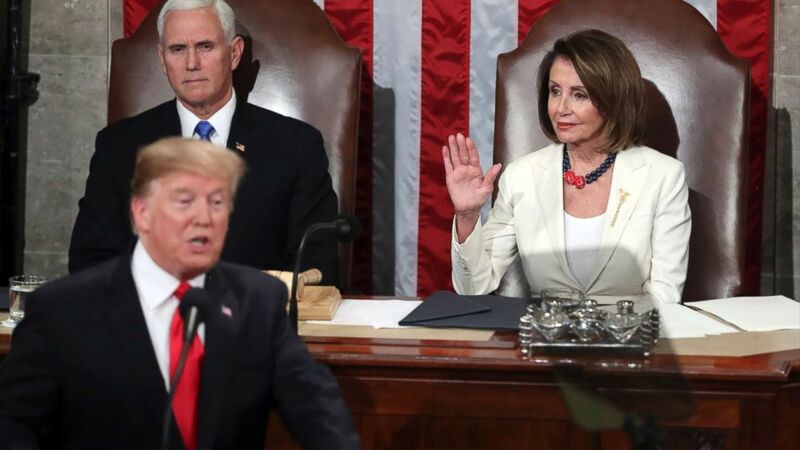 (Andrew Harnik/AP) Speaker of the House Nancy Pelosi raises her hand in a gesture to quiet the Democrats as President Donald Trump delivers his State of the Union address to a joint session of Congress on Capitol Hill in Washington, Feb. 5, 2019. The president started his speech calling for unity, but on that topic of immigration he had few concessions. He doubled down on the idea of a wall even though the majority of Americans, according to ABC News polls, disapprove of one, and he made no mention of young DREAMers looking for legal protection. Over his shoulder throughout was Democratic House Speaker Nancy Pelosi, the only woman ever to hold that office. (Saul Loeb/AFP/Getty Images) President Donald Trump delivers the State of the Union address at the U.S. Capitol in Washington, Feb. 5, 2019. The most organic and spontaneous moment came when the newly elected Democratic women in the House seemed to turn the president's words against him and celebrated their new jobs. One part of the speech likely to resurface in the weeks to come: his lines on pending congressional investigations. "If there is going to be peace and legislation, there cannot be war and investigation," he said, seeming to threaten lawmakers who have pledged more oversight of his administration. The growing field of Democrats running for president is lacking one specific type of candidate: a governor. That could change in the coming weeks as former Colorado Gov. John Hickenlooper, who showed off his bartending skills during a recent trip to Iowa, is set to appear in the crucial early primary state of South Carolina on Wednesday. Hickenlooper has two events in South Carolina: a keynote address at the annual meeting of the South Carolina Hospital Association and a roundtable with local faith leaders. The trip signals that Hickenlooper could be gearing up for a presidential run, and his rhetoric suggests he would run on his record of bipartisan accomplishments during his time as Colorado's chief executive. Other current and former governors who could potentially mount a presidential bid, but have thus far remained on the sideline, include Washington Gov. Jay Inslee, Montana Gov. Steve Bullock and Virginia's former Gov. Terry McAuliffe. ABC News' "Start Here" Podcast. The House Judiciary Committee will conduct a hearing on preventing gun violence at 10 a.m. The hearing comes a week prior to the one-year anniversary of the mass shooting at Marjory Stoneman Douglas High School in Parkland, Florida, that took the lives of 17 students and staff. The House Oversight Committee will host a hearing on national election and ethical rules reform at 10 a.m.
Former U.S. Rep. John Delaney, a Democratic candidate for president, will speak at the Sorenson Winter Innovation Summit at the University of Utah at 9:45 a.m.
Former Colorado Gov. John Hickenlooper will deliver an address to the South Carolina Hospital Association and meet with faith leaders at the Columbia Convention Center in Columbia, South Carolina at 11 a.m.